At maybe just a hair over 7 inches Arnold looks in scale, but still menacing, next to other NECA movie figures (or Reel Toys, as they call them). He's done in a very realistic style and would look good mixed in with other military lines (if they made them in the 7 inch scale, that is), amidst all your Predator figures, or with a hodge podge of other manly men of 1980's action. 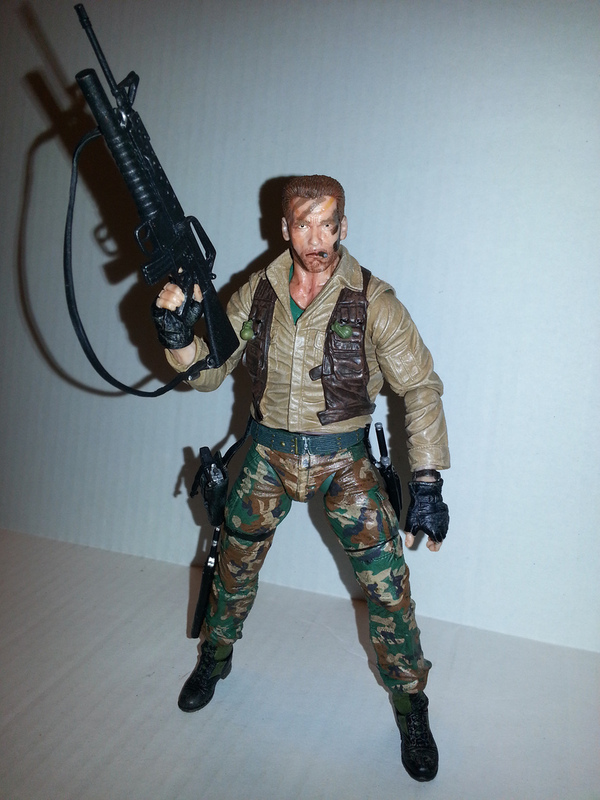 By the way, anyone else want Commando figures?  How about The Running Man? Dang, that would be an incredible line! Anyways, Arnold not only looks good, but he's loaded down with four accessories, all of which he can carry on his person. I'll get to those in a few. 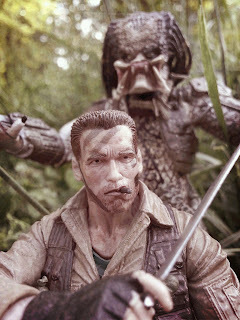 Fun Predator Fact #1: During scripting and much of shooting, the film that would become Predator was titled Hunter. One of the best things that NECA has been doing lately is creating excellently sculpted action figures with equally impressive articulation. Dutch has some of the best and most functional articulation to be seen in a NECA figure since the Rocky figures. He features: ball jointed ankles, boot swivels, ball jointed knees, swivel thighs, ball jointed hips, a ball jointed waist, ball jointed abdomen, ball jointed shoulders, ball jointed elbows, ball jointed wrists, and a ball jointed neck. 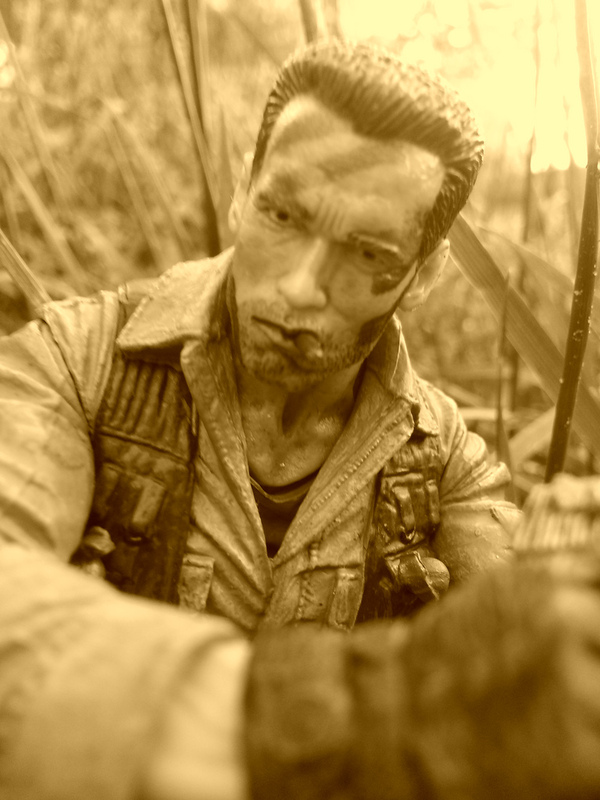 If there's a position that Arnold appears in in the film, most likely this figure can take it. The articulation manages to be very well hidden, so just looking at the figure doesn't fully show you just how impressive the articulation is. I've been posing my Dutch nonstop and have had no QC issues with him at all. That's a real plus. Fun Fact #2: Shane Black was put into the film to keep on eye on director John McTiernan, as Predator was his first studio film. This figure is so well sculpted that if you don't pay attention to it, you may soon find that someone you know gives birth to a child who looks vaguely like Arnold Scwarzenegger. Seriously, it's an amazing sculpt that captures Arnold in his prime. The eye brows, the hair, the brow, everything about the head sculpt is perfect. The look is so cold and steely that you'll feel like a girly man in comparison. And I gotta say, I love the cigar he's chomping on. Yeah, he's not the first action figure in my collection to have a cigar, but he's probably the coolest looking. The uniform is well done, also. Check out his jungle boots. I owned boots like that in high school and these things even mimic the texture of the material on the sides. The wrinkles and folds on all of his clothes look great. Even little details like the watch on his left wrist, the stitching on the BDU pants, and the eye holes on his pistol belt are perfect. If I have one complaint about the sculpting, it's the little grenades that are attached to his vest. They look fine, but they're so small. They're actually separately molded pieces that appear to be glued on, but they seem miniscule compared to Dutch. They really need to be about twice the size they are now, as they look more in scale with a 1/18th inch G.I. Joe. Still, they're the only flaw on an otherwise epic figure. Fun Fact #3: Schwarzenegger lost 25 lbs. during the filming of Predator. The paint perfectly accents the figure. For years, there's been debate amongst action figure fans about what looks best: painted skin or plastic molded in the same tone as the flesh. Typically, I think that painted skin looks better if done right while molded skin often looks glossy. 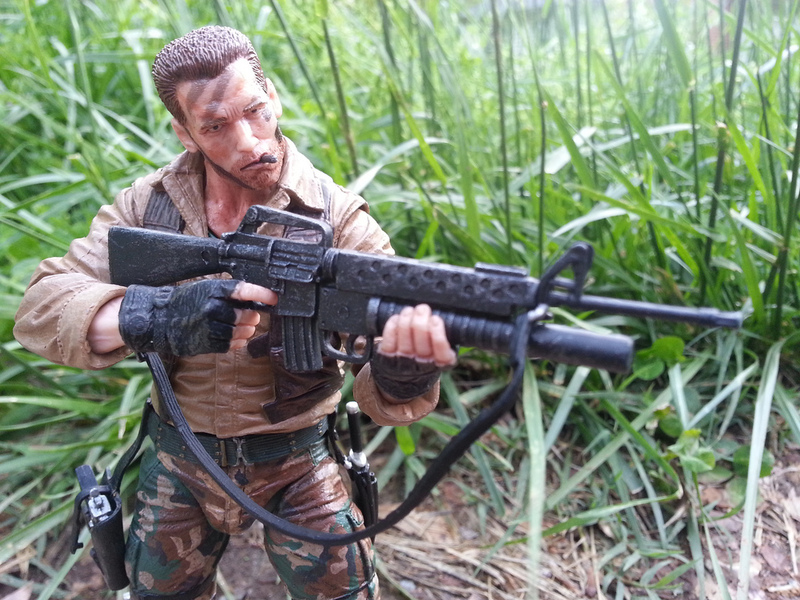 NECA completely sold me on molded skin in with the Rocky line and they've worked wonders with Dutch here, too. The camo pattern on the pants is excellent and the vest and shirt have a nice wash to them. The only issue I have at all is that the t-shirt under Dutch's tan shirt that is visible in certain poses is unpainted. At first I thought it was his stomach showing, but you can clearly see the green t-shirt by his neck. Probably an easy paint app to skip to save money, but it does make itself apparent from time to time. Dutch has four accessories, all of which can be stored on his person. First is his M-16 assault rifle with under slung grenade launcher. It has a great weathered paint job and can either be slung over Dutch's shoulder or held in both hands. It feels a little brittle, but looks excellent. Second, Dutch comes with a Desert Eagle 50 caliber pistol. It's has multiple black paint apps over it's weathered silver frame. It's a bit tough to get Dutch to hold the pistol (his grip is kind of tight) but it can be done. It looks awesome in his holster, though. The holster hangs from his belt on his right hip and has a strap that can hold the pistol in place and a sculpted extra magazine pouch. Third, we get a smaller knife that fits in a sheathe on Dutch's left hip. It's really small and he is unable to hold it without some finagling. It's silver with a black handle. Lastly, we get the weapon exclusive to this Dutch: the giant knife that he throws into one of the guerrillas, to whom he utters the classic line, "stick around." The knife is massive and nicely fits in either Dutch's right hand or in the sheathe on his right lower leg. Fun Fact #5: A bodyguard was hired on set for Sonny Landham, not to protect him, but to protect the crew from him. This was requested by the studio's insurance company. I love this figure, despite my minor qualms. I wish his lower torso were painted to match his upper torso (green, since it's supposed to be his t-shirt, and I wish the grenades on his vest were a bit larger. 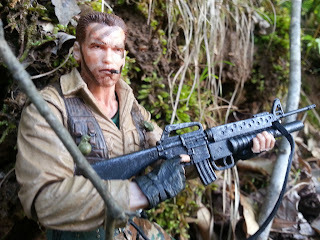 Still, I can't describe how amazing Dutch looks and how cool it is to have a figure of him. Definitely one of my favorite head sculpts of the year, as the Arnold likeness is outstanding. I wasn't sure I'd be picking all of these up, but at this point I'm planning to do so. I really hope NECA reconsiders there previous position of only doing Dutch and not making the rest of the team. I'd buy them all. 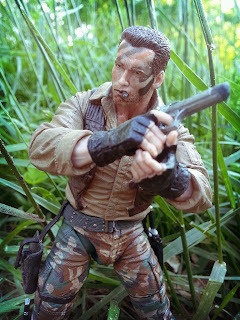 It's so exciting to have an iconic action hero like Arnold immortalized as a well articulated exceptionally sculpted toy. 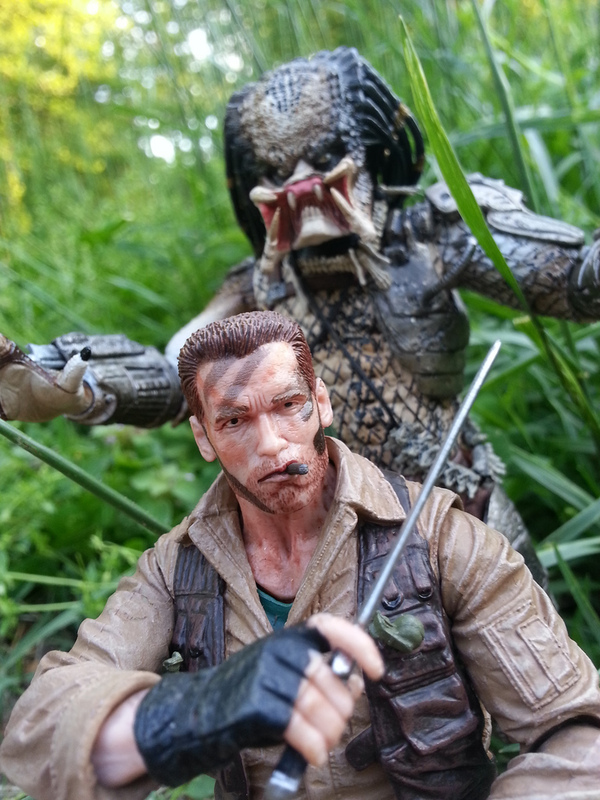 And make no mistake, NECA has not just crafted a good collector's figure but an excellent toy, as well. He feels every bit as ready for play as any G.I. Joe I've purchased lately. What are you waiting for? Go and pick up this figure as soon as you can. Do it! Do it now!! It's confirmed great and a half. Barbecue17 never gets tired of watching Predator. Ever. He constantly loops it on 3 TVs and Netflix instant watch on his computer. On the rare occasion when he's not watching it, he puts pictures on his Flickr account.